When London Fashion Week started recently, most fashion enthusiasts and bloggers were either heading on down to Somerset House, or maybe tuning in to Style.com to see coverage of the latest shows. However, I was doing neither of these things - instead I was sitting in a hospital waiting room, ready to have yet another x-ray. Having said that, LFW was still playing on my mind - I was perched there in my red silk vintage gentlemen's dressing gown (and yes, with matching lipstick!) over the rather nasty, and much less stylish blue hospital robe. The reason for this visit to an Orthopedic hospital? Scoliosis. Right at the end of last year, I discovered that I have a medical condition that affects my spine, called scoliosis. Put very simply, it means my spine is twisted, for no other reason than ‘it happens’ during growth spurts, when one side of the spine grows faster than the other. Instead of looking like an exclamation mark, my vertebrae now form a lopsided question mark. Having been diagnosed, I spent the first half of the year getting to grips with accepting that these unexpected, rather different curves and shifted-sideways shapes of my body were the new me that I’d be inhabiting for the rest of my life. I was pretty much told by that first consultant that I’d just have to get used to it. Mostly, I didn’t really notice, and given that I’ve never been one for clingy, scanty or revealing clothes, neither did anyone else. I was also able to control my increasing back pain using the Alexander Technique and Cranial Osteopathy and to conceal the more obvious mis-shapes with careful clothing, wide belts, my long hair and good camera angles. But, like Jack’s beanstalk, I continued to grow… and, though I was ignoring the signs, by the end of the summer, we began to suspect that the curvature had worsened significantly. It had - and when a spine twists further, it forces ribs and shoulder blades into ever more buckled distortion and begins to squeeze rather important bits of insides. However, I've used this imminent operation as a reason to finally create an idea that has been lurking at the back of my mind for a while... This is a dress I have designed in homage to Alexander McQueen that I’m calling my ‘scoliodress’. 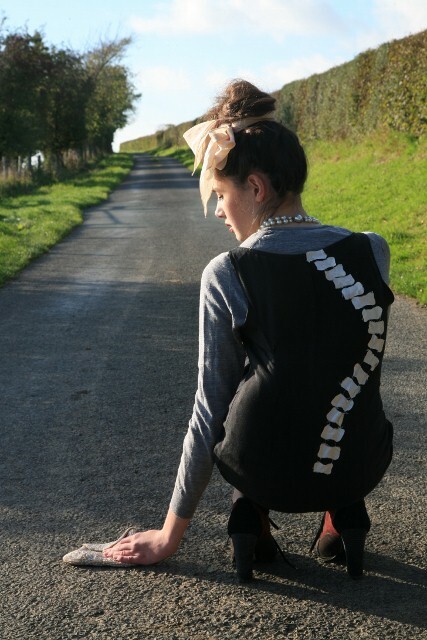 I have used X-rays of my own spine to depict the current line of MY vertebrae, using McQueen’s design concept of a spine print that fits against the spine of the wearer (created a few seasons ago). It’s an ‘inside out’ dress: what’s inside featured on the outside. 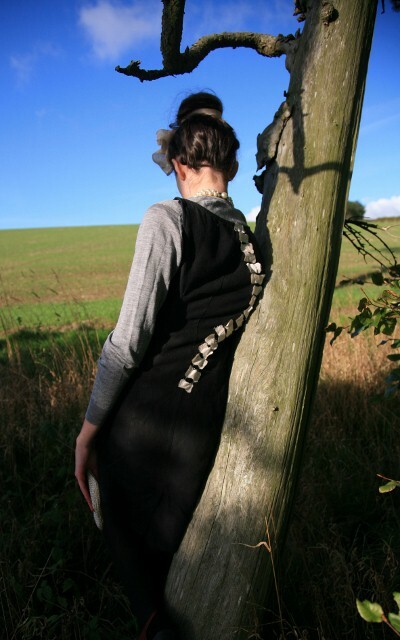 I made the vertebrae out of raw silk (scraps left over from the making of my mum's wedding dress), and attached them to a little black dress - charity shopped, obviously! The process of turning my problem into something creative has been very cathartic. I also did some photographic self portraits of my back, but if I feel ready to share them, that will be after the operation. This is my backbone, my spine externally represented and revealed. And to just follow the rest of the normal blog format - The shoes are my newest acquisition, bought with my Next voucher. This is the last time I'll be able to wear heels in a while, so I'm enjoying them while I can! The vintage pearls were family inherited, and so is the little pearl clutch. My hair is a new variation on the 'up-do', now having become a fully functional topknot. My dad took the photos up in the hills, and we tried to contrast the shape of the dress with stright things (such as the road and horizon) as well as the twisted elements of nature. Sooo, this will be my last post for a while. I’m told that if the surgery is straightforward and there are no complications, recovery is in the region of 6-8 weeks in the first instance. I’ve been stockpiling outfit shoots and other photographic projects of my own, so once I’m able to sit up and use my laptop again (or even if I have to recline in a melodramatic manner on a chaise longue and dictate to a willing helper) I’ll be back to blogging. One of my biggest concerns is actually the length of time it will be before I can use my camera again! I think it should be permanently glued to my side. But it’s all one step at a time. One thing I’ve really begun noticing and being fascinated by are twists and turns and sinuous crookedness in nature - especially trees. I love the way that branches contort and wrap round and bend to the force of the wind. Trees have a natural twisted beauty. So do the curves and coils of shells. My back is just another example of one of nature's anomolies. So, if I have seemed a little unresponsive of late in replying to comments and if my rate of posting has slowed recently, this is the reason why. I enjoyed answering the thoughtful questions she asked, and love the way she presented it! Oh my. Fingers crossed, knock on wood for you and the operation. I'll think of you on the very day. An acquaintance of mine had the same condition and had her operation during the summer. The change is actually astonishing. There is such a huge difference. I hope everything goes to plan (as I'm sure it will) and that you're up and about in no time at all! This is beautiful! The dress and your words! Good luck with all that you are about to go through! I am sure you will find a way to document this time and turn it into something beautiful...you are so strong! Darling girl!... I wish you so much luck in your operation. And I think you are simply an astonishing individual to turn something that could be very upsetting into beautiful fashion art. Bravo, my love! My family will be thinking of yours, and I'll be waiting patiently for your next round of updates! I know your surgery will go brilliantly! Your condition does not make you any less beautiful. I hope that your operation will go smoothly and you feel better in no time. Ros my darling I will be thinking about you on the day of your op, but I am sure eveything will be just fine. I think Mr McQueen would have really liked to see this post. Oh darling, what a thing to have to deal with. I'm thinking good thoughts for you, hang in there. Good luck!!! I hope everything goes well!!! I had a tiny bit of scoliosis when I was younger but it fixed itself. I LOVE the homage to McQueen, the dress looks great!! The spine outline caught me right away - very beautiful. Having read about the concept behind it makes it even more amazing. I know what it's like having back problems and how freaking scary it is, especially once things like operations and braces come into the picture. I hope everything turns out well. I also really adore this dress of yours! It's totally genius! I admire that you can make something wonderful and beautiful from a situation like this. Will be thinking of you, best wishes! Roz, I understand what you're going through. I too have very pronounced scoliosis and have spent years wishing that my back wasn't this way, but I have grown to accept that the fact that my back is still mostly healthy is a wonderful thing. It is good that you are getting the surgery and I hope it goes well. I also found osteopathy, yoga and the Alexander technique to help. Once you have recovered from the operation just treat your back like the fragile beautiful thing it is and always remember to take breaks from sitting, go on walks often, and take care of yourself. I will be thinking of you and hoping that all goes well. You are strong and wonderful and I'm sure will get through this without a hitch. Good luck! Good luck with your operation, love! :) I'll be thinking of you! You know I hadn't even noticed the curvature in these photos, I was too busy 'aaaahhhh'ing at the prettiness. Also, that dress is amazing. And the fact you even had that fantastic creative idea... the artist is obviously in your blood. Good luck with the op!! Best of luck with the operation, I really hope it all goes well. I love what you have done with this dress. It is really inspiring to see you turn something you have been struggling with into something beautiful. The dress is really really cool and genius and I am sending you happy thoughts :). To make something beautiful out of your hardships- that is simply amazing. It's true art. Best of luck for your operation. It's amazing how you have styled clothes to cover this. And this shoot is particularly beautiful. Will be thinking of you on Wednesday! Very best wishes for the op. Love the fact you have used something difficult for inspiration, very healthy. Looking forward to when you are back blogging and taking pictures. Wow, what an incredible post. Very few people could face this with such grace and bravery. Best of luck. oh lovely roz...i wish you the best outcome and recovery. you're young and seem healthy, so it shouldn't take too long. do take good care of yourself and don't worry about blogging when you don't feel up to it. your writing is beautiful- and your attitude is amazing. the fact that you've used your creativity as an outlet during this time says much about your character, maturity and wisdom way behind your years. Wow. You've truly inspired me. The dress is just amazing. that is a wonderful dress concept you put together. having used your own spine xray to create it just outstands me. nothing but the best of wishes for your speedy recovery. Dear Roz, here comes warm greetings from Nanaimo, British Columbia, Canada. I'm wishing you all the best and I hope your operation goes as smoothly as such things possibly can. I so admire your many artistic talents and your great way with words. At first I was taken aback and rather saddened by your post, but the sentence about reclining in a melodramatic manner on a chaise lounge, while giving dictation to a willing helper, that made me chuckle. You have great attitude! Looking forward to your posts once you're on the mend. I'll send good thoughts your way on Wednesday. Best of luck to you! Seems like you have a very positive attitude about the whole thing. Rest up, take your time, and be patient with your body! We all support you, wish for the best operation and recuperation, and will be here when you get back! Oh my goodness, I'm sorry to hear about your condition! (As a gal who went through an abnormal growth spurt herself, I can well understand the pain. I didn't get scoliosis, surprisingly. My pains showed up in other areas.) I dearly hope that the surgery goes well as does the recovery. We'll miss you very much here in the blogosphere, but you need to what's best for you and rest up! Thanks for being such an inspiration Roz. The dress you made was extremely creative and as you said, cathartic. Can't wait to see you back and healed! I have Scoliosis too, I hope your operation goes smoothly! I'll write to you privately, I just want to say publicly, here.. I don't know what to say, except, having met you once so far, and become friendly with you and your wonderful mom.. the dignity and grace of this post has moved me to tears. And courage. And CLASS. Good luck, wish you the best! Roz you are such a brave lady to share this with us. I think it's beautiful how you have chosen to express this through one of the things you do best, which is taking clothes and making them suit you exactly. I hope you know that my thoughts and prayers are with you both during this operation and your recovery. Keep being the beautiful girl you are every post in your blog and I'm sure in real life as well. I'm a recent reader of your blog (I'm french so excuse my english level). I'm fascinated by your photos : you're extremely beautiful, okay, but there is something very special, very different on your photos and if your friends are totally chaming too you have a special way in front of a camera. I have a scoliosis trouble too, but realy less important than yours. I'm sorry about this surgery and I wish the best for you. Hi, I found out about you through Jill's blog (Polka Dot). I just wanted to come say hi and read about your story. It was very smart of you to channel this into something creative :). I hope everything goes great! The best of luck to you! Brave, beautiful post, and best of wishes for your surgery. Stay well! Wishing you a complete and speedy recovery. Your beautiful and well written blog always make me smile. Best wishes from California. I wish you all the best and a fast recovery! I just'met' you. Both the photos, and you, are amazing. Best of luck for as speedy a recovery as possible. Looking forward to hearing from you. Keeping you in my thoughts and wishing you a speedy recovery. This was such a beautiful, brave and honest post. My cousin suffers from scoliosis and know how physically and emotionally draining this can be on a person and his/her body. Thank you soooo much for sharing such a positive and courageous view of this diagnosis. you have an amazing blog, i love the pictures. Your last post was an eye opener on a truly amazing individual and also reading the comments that followed that blog has really moved me. I wish you absolute success with your operation and feel you will come through it as an even more magnificent force to be reckoned with :~) Good luck Roz. Best wishes, hope you don't have to wait too long to resume your brilliant creative projects and start many new ones. Love your lines on trees; I suppose trees are like representations of human lives, full of twists and turns, and stronger and more beautiful for them. I did post a comment, but can't seem to find it... So just incase you didn't read it.. I would just like you to know that I think you have managed to turn this into such a beautiful and inspiring art form; which is something I would expect from your amazing talents. You have such beauty and I am sure all will go well with your op, I will be thinking of you! Good luck hun. You are so mature and have dealt with this in such an honourable way, I would have never have guessed it from your poise and elegance. you are very talented and your drive to get back photographing will really help with your recovery. I read your words regularly, but have never commented before now. I find your dress design beautiful and your spirit incredible. I wish you the best of luck with the surgery and ever after. Good luck!!! I'm sure you'll be fine after the op, a friend at school had the same thing and is now perfectly happy and completely the same as normal- if a little taller! I find it so amazing how you can turn this into a dress idea. So creative and inspiring. I'm crossing my fingers for you can cannot wait for the next post. All the best to you as you go into surgery. Just think of how much better you will feel after you have recovered. After this period, you can move on unencumbered! Good luck! I found you through Street Style: Pics by Polka Dot, and I must say that you have a lovely blog. As for your surgery I truly hope it all goes well and that you're back and healthy soon! Ah, crap. Feeling a bit emotional here. Roz: reading this post has made me realize one thing: That as beautiful as YOU are, the best beauty found here on this style blog is your incredible mind. How you share parts of who you are in the parlance of fashion and style. So cerebral without being overly so. The jacket: brilliant. The catharsis: priceless. The way you just transformed a very stressful concern into a beautiful project truly inspires me, and I'm sure, many many others. I will be thinking of you and your soon-to-be speedy recovery from the operation. My prayers are with you and your family. I know these must be such a tough thing to go through so young, but I trust you have the character and grit to not only get through these tough times but to do so with grace, elegance and aplomb. Thank you for stockpiling photos for future posts. I look forward in seeing them. Hi Roz, I got to know about your blog via Bella aka The Citizen Rosebud. i m speachless really...so beautiful,so brave,so mature in thought and yet a child...may god help you through this!get well soon! I just came across your blog a few minutes ago, and read about the operation tomorrow. I had a scoliosis operation many years ago, so I just had to leave you a comment to wish you good luck. I want to wish you all the best, a speedy recovery and a lot of strength to see you through it. Also courage to you parents- they will need it as much as you will. Hi Roz, new follower here! I've only just discovered your blog, but am literally astounded by your talent and beauty, your photos are staggeringly beautiful, as are you. I have mild scoliosis myself, but nothing as bad as yours, as well as an extra vertebrae near the top of my spine. You have given me the confidence that I may not have perfect posture but this can still be beautiful, as you so depict in your 'scoliodress'! Good luck for tomorrow, i wish you a speedy recovery, and look forward to seeing and reading more from you when you're well and able! You and your blog are a true inspiration. This is such an inspiring post. I wish you a safe surgery and full recovery. Oh my! I truly hope your operation went well. To manage to turn such a traumatic experience into something so creative and affirming is just brilliant. Reading your blog is always a very enjoyable experience, but this post really shocked me- not just your condition but your attitude towards it. I'm not sure i would be as brave in the same situation! I can't tell you how much i admire your frankness and dignity, as well as your beautiful writing! Your photos are especially strong, being so unflinching. I love how you were brave enough to create a whole concept around your scoliosis, i don't think anyone else would ever think of such an idea. We'll all be praying for your quick and full recovery; keep your spirit up. You know the best medicine is laughter. So...What do birds give out on Halloween night?.......Tweets! You better be laughing! Sincerely, I just know you'll be fine because your young and we need you blogging again. P.S.You made the Top19TeenBloggers.com list. I just read this, I hope the operation went well and that you are back to your blogging self asap. Just wanted to let you know that I thought of you yesterday as you got your surgery! All the best for recovery. A friend of mine has scoliosis herself but it isn't quite as severe as yours. I really loved this post, it was like a fashionable diary entry. You're so confident to share this part of your life with your fellow readers :). Wow, power stuff...Especially with the pictures leading up to the story. Great blog. I hope the scoliosis surgery went well.